Where oh where would cinema be without its moustache-twirling, appendage-slicing bad guys? And they come in so many distinct flavours! Scoundrels, cutthroats, rogues, crooks, criminals, and outlaws... you name it, the movie world's got 'em in spades. Some prefer to strategise their naughtiness; they're the type that scheme and cook up plans with great care and consideration. Others are a little less brainy about things, and simply exact their villainy through brute force. 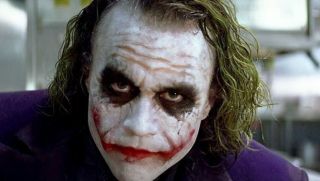 The great thing about an iconic villain is how they can transform an okay movie into something brilliant. This list celebrates these dastardly bastards, from the debonair to the downright depraved. Sometimes it really is good to be bad. The villain: Kathy Bates brings a hideous, hulking physicality to the deranged Ms. Wilkes, whose obsession with author Paul Sheldon spirals out of control when he falls into her care following a car accident. Mixing baby talk with extreme violence, she's just about the worst nurse you could ever wish for. Meanest moment: The hobbling. Who isn't tempted to fast-forward every time it comes around? Nicest quality: Her maternal instincts. True, she's got the bedside manner of Jekyll and Hyde, but without her, Paul would have frozen to death. Although on reflection (see: the hobbling) that might have been preferable. The villain: A coward and a crook, Lime fakes his own death in order to avoid the rap for his penicillin racket. Selling dodgy merchandise is one thing, but when it's watered-down medicine you really have to draw the line. Tut tut, sir. Meanest moment: His diluted penicillin is responsible for hundreds of deaths! Factor in the patients at the hospital he stole it from in the first place, and that's a hell of a lot of blood on his hands. Nicest quality: He's clearly got some entrepreneurial skills. Shame he combines them with his cold, calculated shenanigans. The villain: A textbook case of somebody with small-man syndrome, Tommy is like a coiled spring: he's constantly waiting for somebody to say the wrong thing so he can kick off. Remember, no matter how amusing you find him, it's imperative you keep your feelings to yourself. This gangster's got a weapon for every scenario - and he's also happy to improvise! Meanest moment: When he shoots the hapless Spider in the foot. Although he probably tops that the following week when he shoots the poor lad dead. Nicest quality: Tommy loves his dear old mum, just as every good Wiseguy should. The villain: A killer with a predilection for bumping off sexually precocious teens. Myers' nightmarish appearance (he wears a William Shatner mask) and apparent indestructibility make him the definitive slasher villain. When you make Ernst Blofe-, I mean, Donald Pleasance seem normal, you know you're pretty scary. Meanest moment: Disguising himself in a bedsheet, Myers advances on the unsuspecting Lynda sporting her boyfriend's glasses. The boyfriend he's just killed moments before. Classy stuff Michael. Nicest quality: Despite moving away he knows where his roots are, and returns home at the first opportunity. That's about it. The villain: A hard-case of the worst kind, Begbie goes to the pub for a fight first and a drink second. Witness the throwaway moment in which he chucks a pint glass off a balcony purely so he can get stuck into the ensuing brawl. Feared by friends and enemies alike, he's a total bloody nightmare. Meanest moment: Glassing a portly Londoner and putting his friends newfound wealth in jeopardy in the process. Nicest quality: Erm, he's a patriot? Which means: he beats an American tourist to a pulp in a pub toilet.